Everyone remembers the Tyrrell 6 wheeled F1 car, but where's the Porsche 935 6 wheeler and its rightful place in racing history? 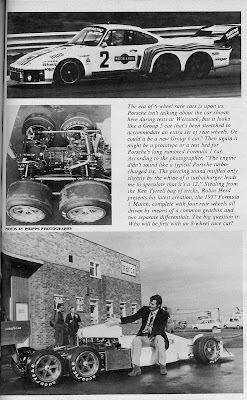 Before racing was all spec series and limited rule sets, racing was dangerous and sometimes innovative. A few daring engineers even braved to ask how many wheels a race car should have. Assuming this is actually a 935 (and not some other test bed) if you put yourself in 1977, perhaps it makes sense. A run of the mill 935 group 5 car might struggle to put nearly 600 hp through 350mm wide 1970's tires. So the only logical option is to add more tires, right? Of course a 935 might have the rear mounted engine between that second axle making it difficult to package a diff. An exhaustive search of the BeaterBlog archive failed to yeild any further information, so for now its left to the imagination. If you suspect this is photoshopped, I encourage you to turn to page 101 of Road and Track's February 1977 issue. I hope the 8 wheeled race car isn't far away.